With matching support from LRSM and other sources, Penn received a $630,000 NSF MRI grant in 2009 to acquire a multifunctional nanoprobe microscope for imaging and spectroscopy of materials. The system combines atomic force microscopy (AFM), near-field scanning optical microscopy (NSOM) and confocal Raman microscopy in a single, multifunctional instrument to enable a broad and powerful array of micro- and nanoscale microscopy and spectroscopy studies. The light sources for the NSOM and Raman components involves a standard laser source as well as a compact, turnkey tunable laser. This tunable laser provides two important capabilities: (1) tunable output wavelength from 350 – 1080 nm, for a broad range of spectroscopy experiments; and (2) femtosecond operation for time-resolved measurements of dynamic nanoscale phenomena. It can function in combination with the microscope for custom spectromicroscopy experiments, but can also be used as a stand-alone laser source for powerful spectroscopy studies of nanostructures and other materials when not needed for microscopy studies, thus maximizing its use. This shared instrumentation is designated as a SEF within the LRSM. The tunable laser along with significant supporting optics was purchased from Coherent. It has been installed and integrated with an existing spectroscopy platform for versatile experimentation. The system is functioning and available for use. 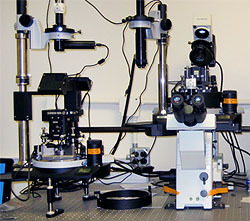 It is currently installed in a lab within the Singh Center for Nanotechnology, directly across the hall from the instruments in the NanoCharacterization Facility, another LRSM SEF. The laboratory was specifically designed to accommodate this instrumentation. The lab includes vibration and EMI isolation, low and quiet air flow, and enhanced temperature control all to enhance the performance of this instrumentation. Several groups are making use of the instrumentation on an ongoing basis. This instrumentation is co-supported by the Nano/Bio Interface Center, a NSF-supported NSEC at Penn.